The men's 100 metres at the 2017 World Championships in Athletics was held at the London Olympic Stadium on 4−5 August. This meet was announced as the last competition for Usain Bolt. The race was won by Justin Gatlin of the United States, ahead of Gatlin's team-mate Christian Coleman, with Bolt finishing third. A scene of the final. 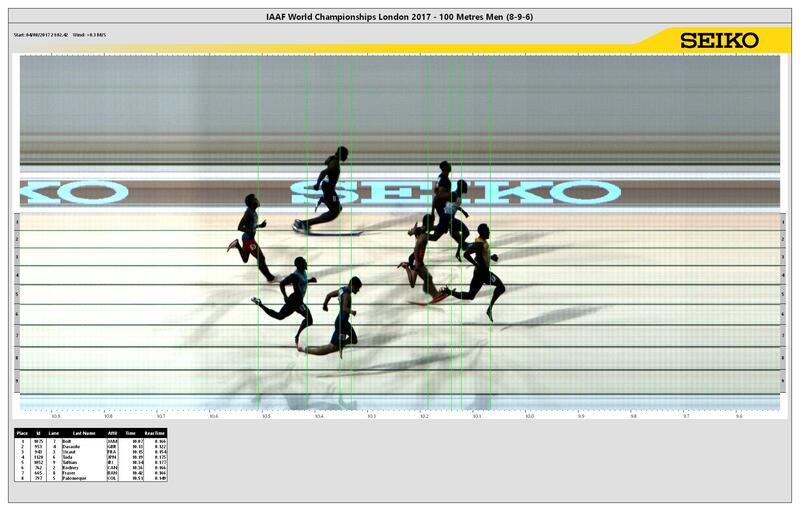 Julian Forte of Jamaica was the fastest in the heats, and the only athlete to have gone under ten seconds in the round with a personal best of 9.99 seconds in the third heat. Japanese runner Abdul Hakim Sani Brown placed himself as a favorite and surprised many by beating Forte's teammate and 2011 World 100m Champion Yohan Blake, who was one of the four favored athletes to beat Usain Bolt, in the second heat. 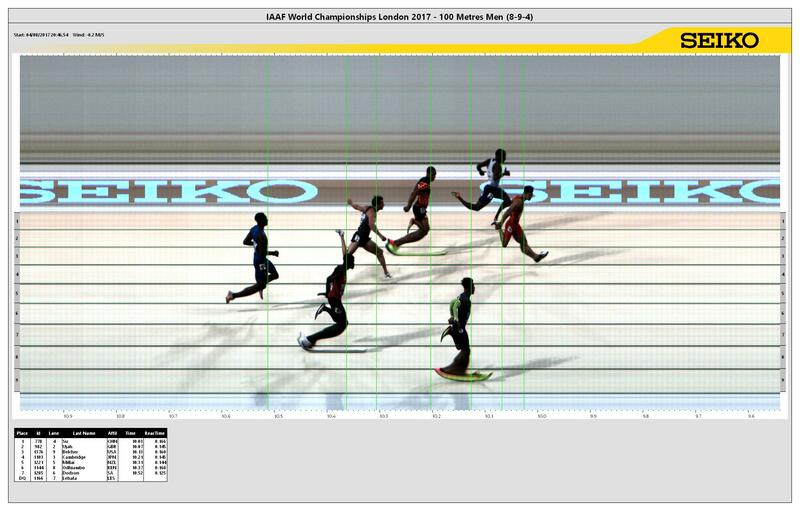 Bolt made his usual slow start, but quickly gained ground and won his heat in 10.07 seconds: his slowest time in the season. In the first semi-final, Justin Gatlin qualified but seemed to struggle, losing to Akani Simbine of South Africa. Both were favorites to dethrone Bolt. 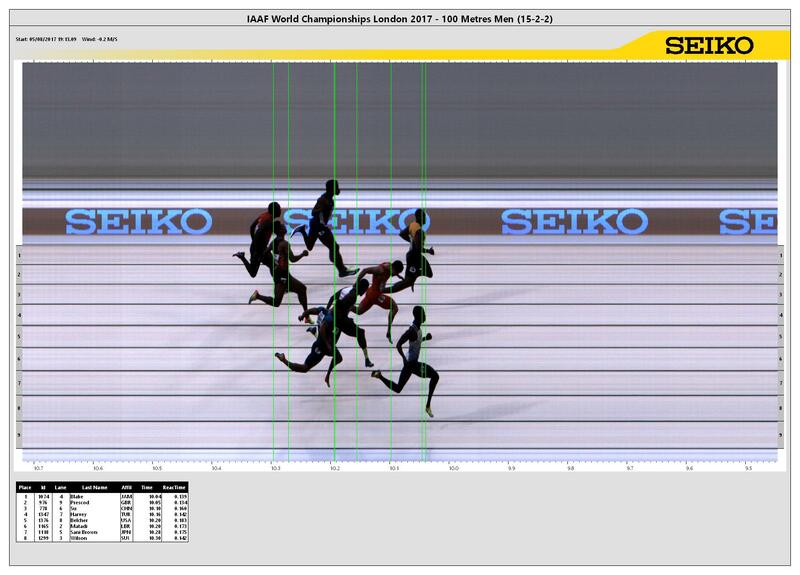 In the second semi-final, Yohan Blake barely held off the hometown favorite Reece Prescod, who had a sudden surge of speed in the last ten metres to take the automatic qualifying spot from Su Bingtian of China. Run into slight headwinds, the first two semis were unimpressive, slower than ten seconds. 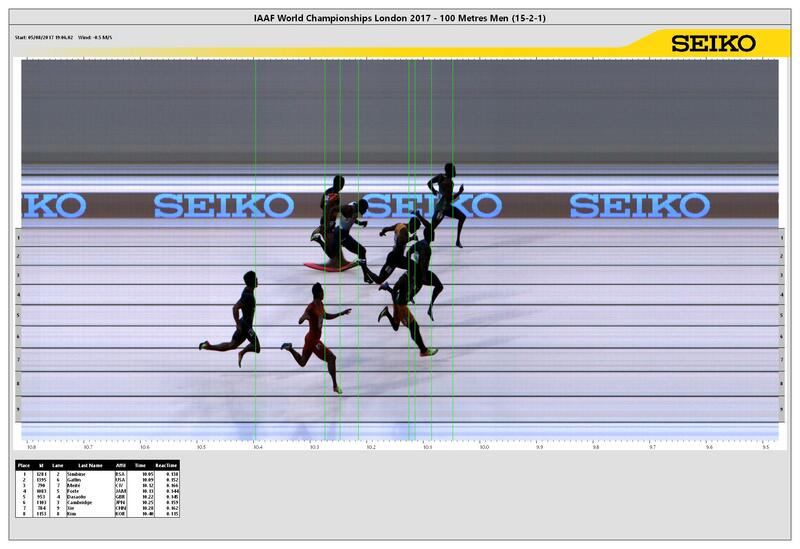 In the third semi-final, Christian Coleman surprised the world by beating Bolt with 9.97 to his 9.98, despite it being a semi-final; in doing so, he became the first man in four years to beat Bolt, the last being Gatlin by the same margin (0.01) in an IAAF Diamond League event in Rome. Coleman rocketed out of the start, while Bolt lumbered. 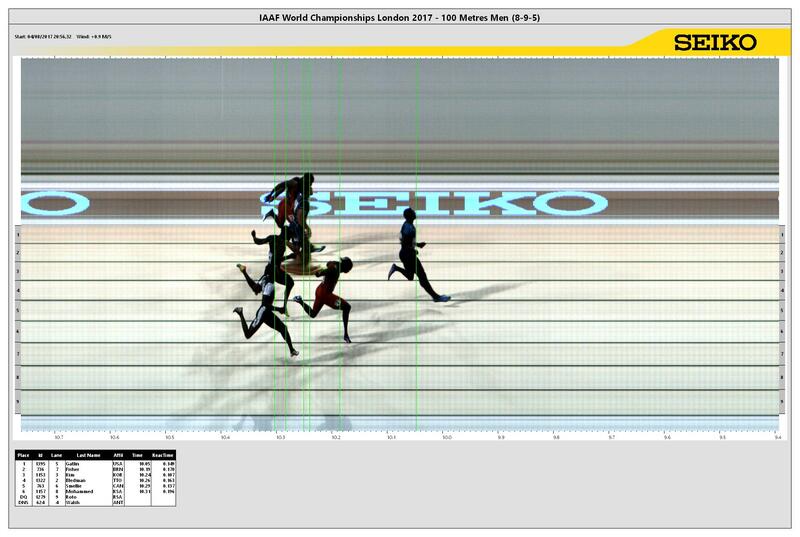 Bolt tried to make up the gap, but sensing he couldn't catch him, eased up at the finish. Bolt's time was still the second fastest in the semis. 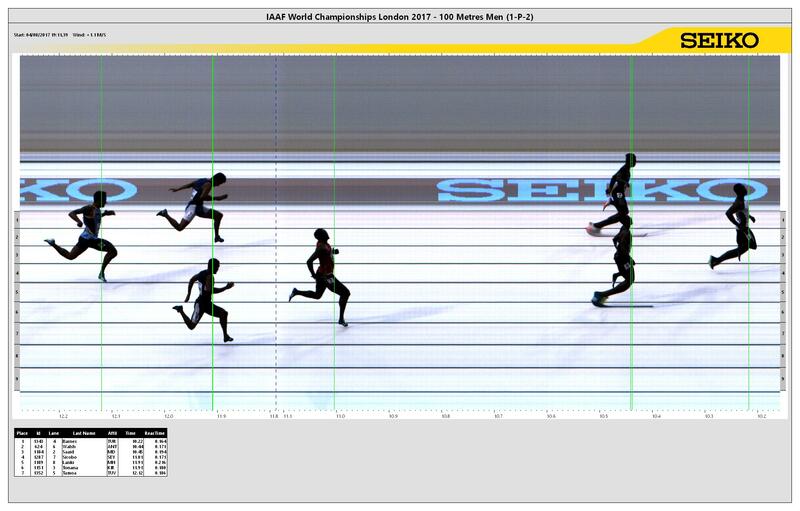 In the final, Bolt was lined up in lane four, right next to his young rival Coleman. Gatlin lined up in lane eight, with Blake right next to him. At the gun, Coleman got the quickest reaction time, of 0.123, and Bolt with the second slowest in 0.183. 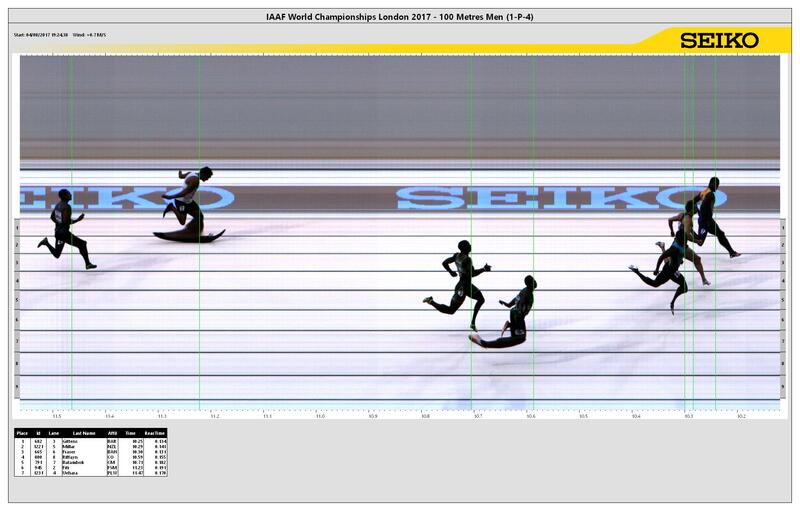 Coleman continued with his usual fast start, with Bolt next to him lumbering behind by a metre in fourth expecting to make up ground on Jimmy Vicaut of France and Su Bingtian inside him. Meanwhile, the other half of the field seemed to struggle in the first 40 metres, but began to catch up with the pack afterwards. 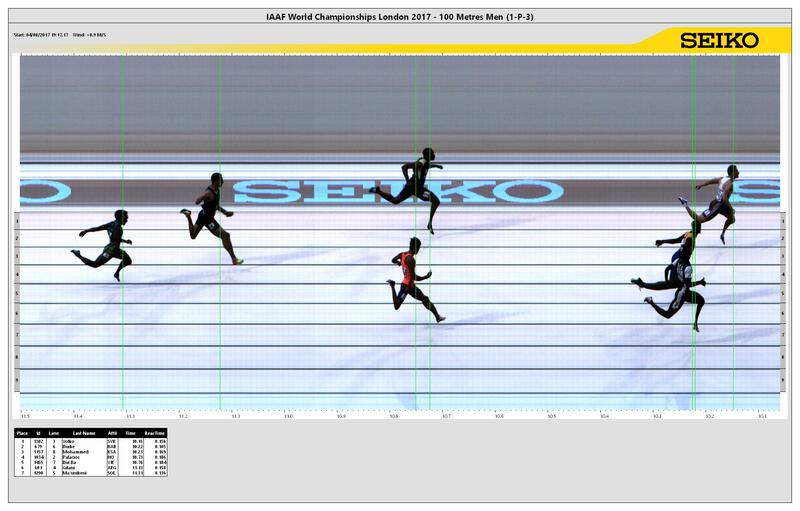 At that mark, Bolt began making up ground, first on Su, then on Vicaut. With every step, Bolt gained on his young rival, but as he got closer he began to tense up. 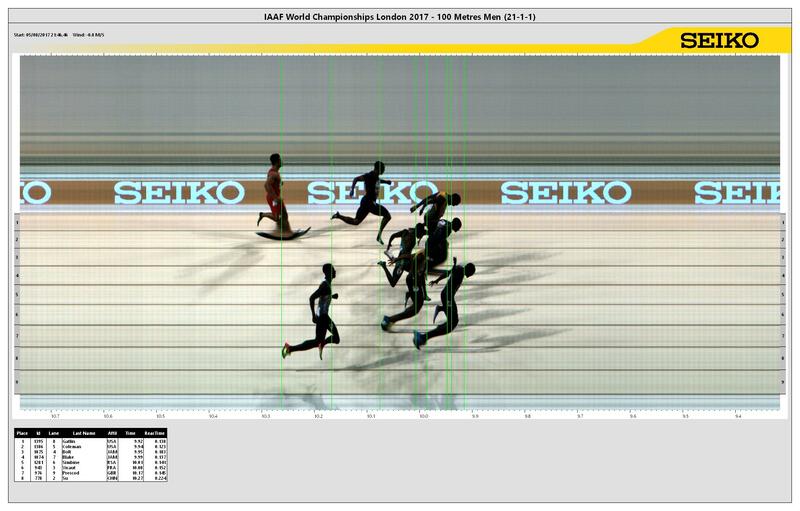 Suddenly, with 15 metres to go, Gatlin in lane eight came out of nowhere and surged ahead of the two, securing his first world title since 2005 by 0.02 seconds. 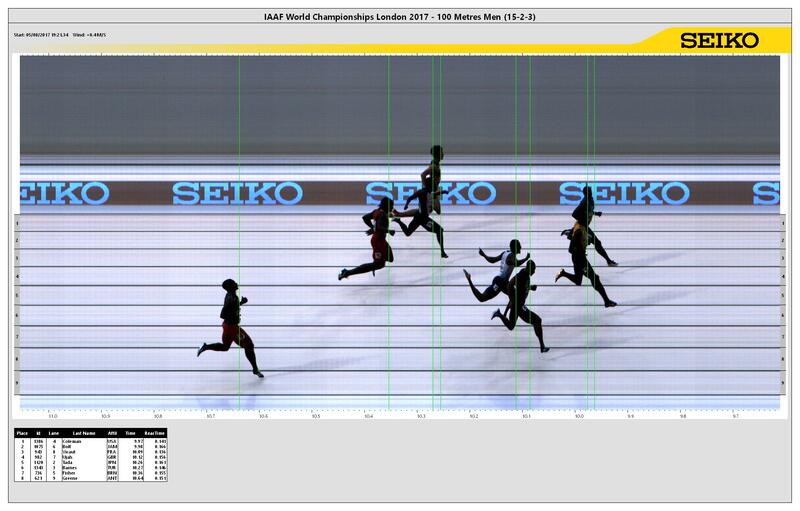 Gatlin's winning time of 9.92 seconds was the slowest World Championship winning time in the 100 metres since 2003, but was a new Masters world record, beating Kim Collins' 9.93 that he set the previous year. Coleman finished second in 9.94 seconds, while Bolt was third in 9.95 seconds, equaling his seasonal best that he set in Monaco. The standard to qualify automatically for entry was 10.12. ^ a b "Records Outdoor – Men" (PDF). World Masters Athletics. Archived from the original (PDF) on 25 September 2016. Retrieved 9 August 2017. 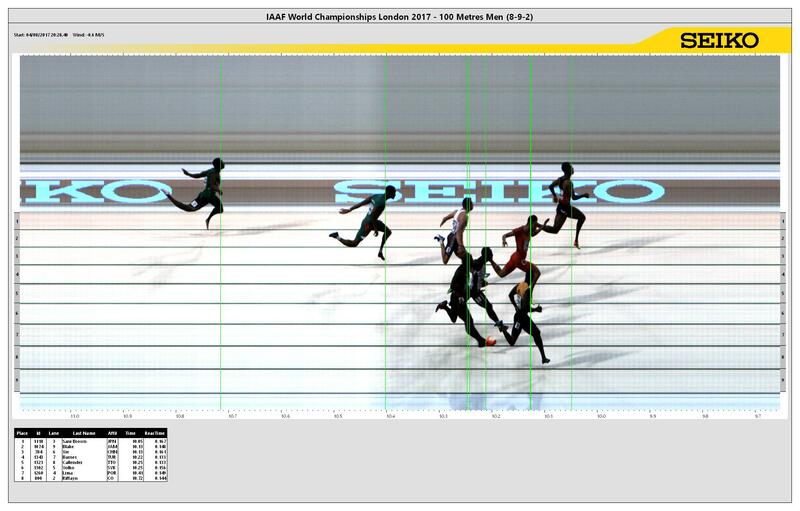 ^ "World Athletics Championships 2017: Justin Gatlin beats Usain Bolt to 100m gold – as it happened". The Guardian. 5 August 2017. Retrieved 9 August 2017. ^ "100 Metres Men − Records". IAAF. Retrieved 31 July 2017. ^ "Records Set - Final" (PDF). IAAF. Retrieved 14 August 2017. ^ "Qualification System and Entry Standards" (PDF). IAAF. Retrieved 9 August 2017. ^ "100 Metres Men − Timetable". IAAF. Retrieved 9 August 2017. ^ "100 Metres Men − Preliminary Rounds − Results" (PDF). IAAF. Retrieved 6 August 2017. ^ "100 Metres Men − Preliminary Rounds − Summary" (PDF). IAAF. Retrieved 6 August 2017. ^ "100 Metres Men − Heats − Results" (PDF). IAAF. Retrieved 6 August 2017. ^ "100 Metres Men − Heats − Summary" (PDF). IAAF. Retrieved 6 August 2017. 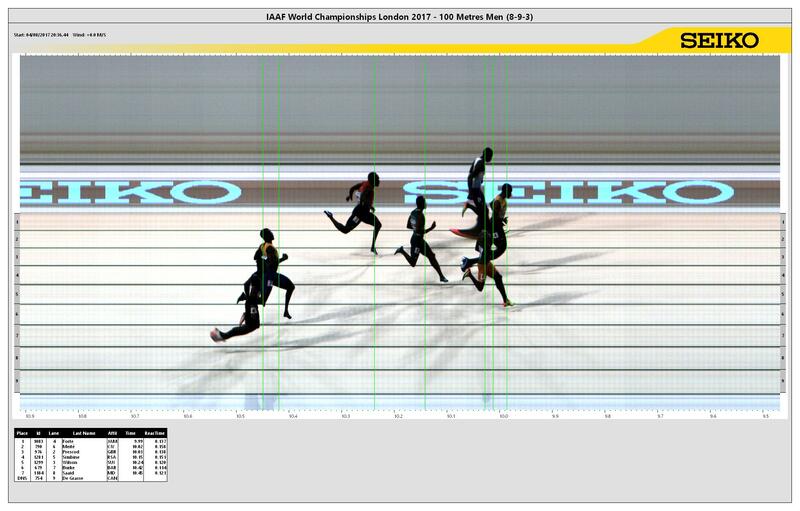 ^ "100 Metres Men − Semi-Final − Results" (PDF). IAAF. Retrieved 6 August 2017. 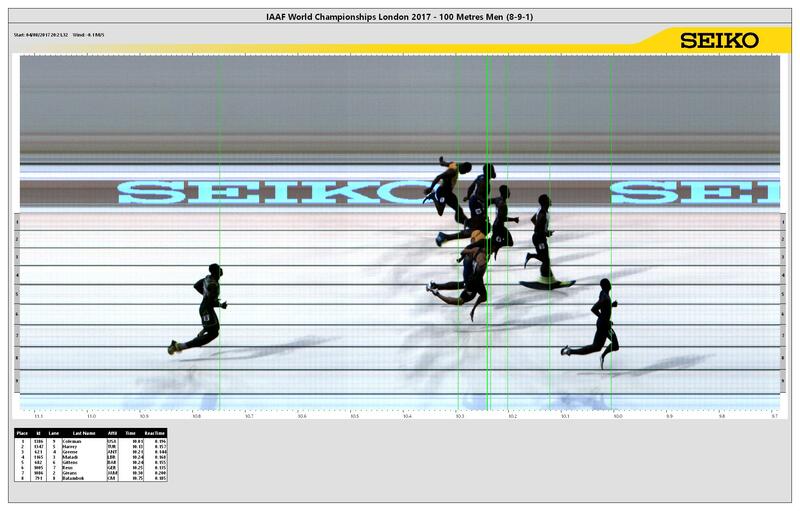 ^ "100 Metres Men − Semi-Final − Summary" (PDF). IAAF. Retrieved 6 August 2017. 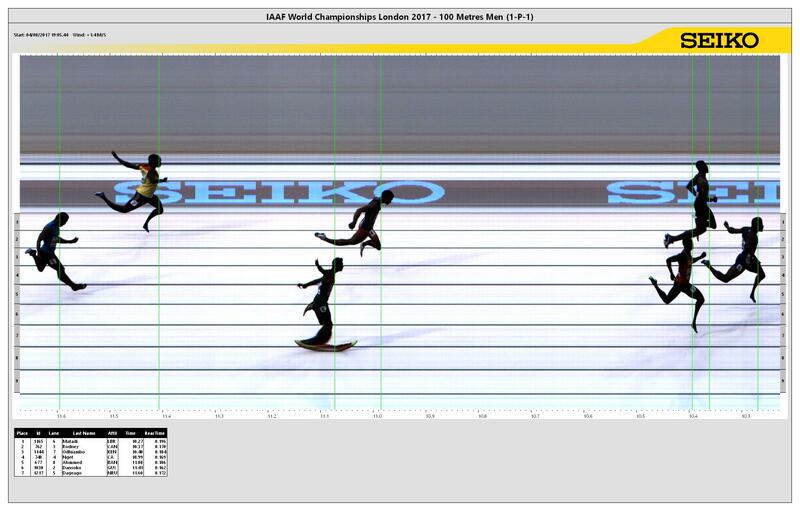 ^ "100 Metres Men − Final − Results" (PDF). IAAF. Retrieved 6 August 2017.